You will need a size 2 round watercolour brush. My preference is for a white taklon brush. Any of the following will do, or whatever is available at your local art shop. You will need 1 or more liquid watercolours. If you are buying only one, I recommend either black, or your favourite colour (the goal is to encourage you to use and enjoy it). If you can only afford 2-3, I recommend pink, blue, and green – you will be able to mix purple and teal from these as well. My all time favourite is Ecoline Liquid Watercolours, but they can be a little tricky to source in some countries. Any of the following will work, or whatever you can find at your local art store. 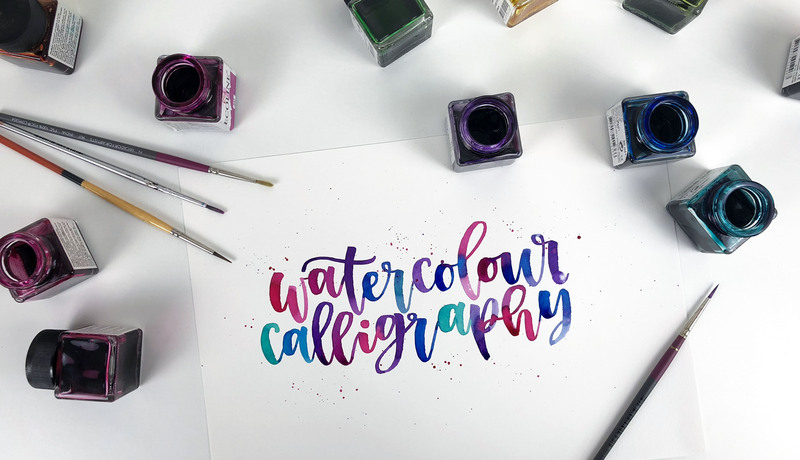 When it comes to getting started with watercolour calligraphy, you’re going to want to go through a lot of paper. So I recommend buying something you’re happy to ‘waste’. Don’t buy beautiful, cold-pressed watercolour paper that costs $$ per page! To be totally honest, I do lots of my practice on basic laser printer paper from an office supplies store. For blending and creating instagram videos, I love a medium-weight multipurpose art paper with a little bit of texture – around 200-250gsm / 135-170lbs such as the following.